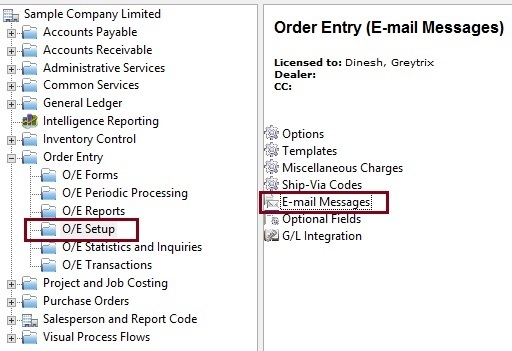 In Sage 300 ERP the primary purpose of E-mail messages option is to create e-mail messages to send with order confirmations, quotes, invoices, and credit notes. Each message is identified with a unique message ID of up to 16 characters. We use this message ID to select the message when you select Customer as the delivery method on an Order Entry customer form (an order confirmation, quote, invoice, credit note, or debit note). In this blog we are going to discuss the details to setup the E-mail message. Below are the steps to find the E-mail Messages option. A variable is a string of characters in an e-mail message that is replaced with a specific term or value when the message is sent. Example: In an e-mail message to a company where the customer contact is specified as Ron Black, the line “Dear $CUSTOMER_CONTACT” will be replaced with “Dear Ron Black” when the message is sent. For Invoice number $INVOICE_NUMBER will be used. Open Order Entry -> O/E Setup -> E-mail Messages. 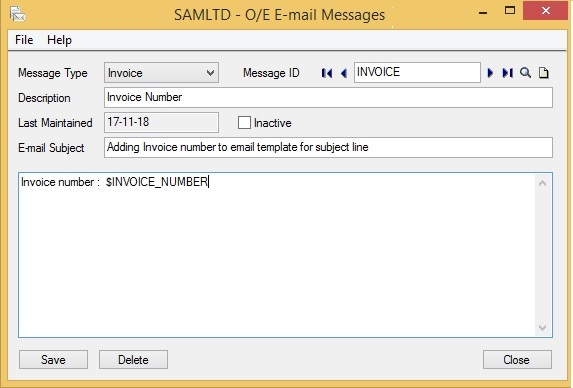 On the Message Type list, select the type of document for which you are creating a message such as order confirmation, quote, invoice, credit note, or debit note. In the Message ID field, we can enter a unique code to identify the new message, using up to 16 characters. In the E-Mail message body, we can use variables that will be replaced with information from our database when we send the message. Then Click on Add or Save to save the message.